There's nothing more satisfying than a new DIY project. Even now, an electric sander is humming out back while my husband works on our van conversion. And whether it's rebuilding my van into a home alongside my husband or making my own sunscreen, I get a thrill from making and doing. But eventually, all those hobby tools tend to need some space to call home, somewhere that isn't you (or your friend's) garage. Sometimes what you need is a good shed to keep the yard and garage nice and tidy. Here are a handful of the very best sheds around the web that can help you organize all your DIY needs. The time of year when lighting a fire's the furthest thing from our mind is actually when we should be stacking and seasoning our firewood for the upcoming winter. The trick is figuring out where to put it all without rain and bugs getting the best of your fireplace dreams. Thanks to firewood sheds, you can keep that wood dry and ready all year round. I love the plan for this shed from Emily Fazio over at DIY Network; it's small and convenient, perfect for those of you just looking for a place to store wood for those relaxing fires in the cooler months. Her plan utilizes upcycled materials, which is an awesome way to economize – and help the planet out by cutting down on waste. My favorite part of her shed? Her staining method, a natural technique using a combination of vinegar and steel wool. As cute as the first shed is, if you're heating your house with a wood-burning stove this winter, then check out this larger shed from over at Popular Mechanics. It is capable of storing over a cord of firewood, and could easily be adapted to hold more, helping you keep the wood dry for your family all winter long. Over at Wood Heat, a nonprofit dedicated to the safe use of wood as fuel in the home, they've got a sweet, self-proclaimed funky woodshed. I love how versatile the plan is, for whatever you envision. All three photos of woodsheds based off the plan vary, catering to everyone's aesthetic – while holding a lot of wood, to boot. This last shed is top of the line. If you're looking to invest a chunk of your time to make a hsed that will last, keep the wood dry, and beautify your backyard, then this shed over at Weekndr is calling you. I don't know what I love more – the shingled look or the devil-may-care attitude the maker had! Nowadays, we're all trying to live with a little less space. If you don't have the largest yard, space if valuable. After all, where would your garden beds go if you had a massive shed – and its shadow – taking up the bulk of your yard? Over at Family Handyman, they've figured out a solution with this absurdly precious garden closet. It's small, but seems to hold a lot – those hanging storage containers on the doors really seal the deal for this being an excellent way to maximize your space. I love how small it is, and how much it seems to hold – those hanging storage containers on the door really seal the deal for this one being an excellent use of space. Ana White is a true woodworking aficionado with a website well worth checking out – starting with this cedar shed. While cedar typically translates to a high price tag, her DIY shed circumvents that because of one clever trick: using cedar fencing pickets as siding. I love me some Mother Earth News. From recipes to new studies, they always seem to have exactly what I'm looking for – like plans for a garden shed that can be made in just a weekend, with limited carpentry know-how. Their plans are simple, adaptable, and free to download here. Even if you're not much of a gardener, but looking for a place to store those other odds and ends – camping gear, bikes, pogo sticks – then there are still a wealth of plans with your name on it. Over at Great Outdoor Ideas, Rob Palmer has a video with a great shed that's simple enough to put up in a weekend. I love that he builds a foundation, and adds concrete slabs as flooring. It helps make the potential uses more versatile – like a small escape nook, or a shed for workshopping. While this video isn't a plan per se, it walks you through each step in a way that's easy enough to follow – if you have a little woodworking experience under your belt! Alright, this one may just be the cutest shed in the batch. 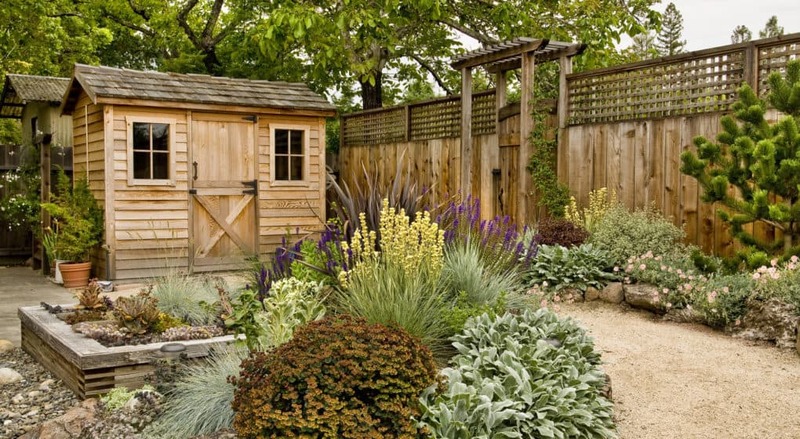 If the shed's appearance is pivotal to your yard's overall aesthetic, then look no further. This plan – from over at the Family Handyman again – is for a shed in the old schoolhouse style, complete with a cupola that aids in ventilation. This is one of those sheds that would be perfect for converting into a reading nook, a sewing room, or a quaint, if unconventional, guest space. My mind's spinning with all the possibilities in this thing! While hunting the web for interesting sheds, I found two that were so unique, I couldn't resist sharing them with you all. Although they don't fit under any tidy category, these sheds provide some stellar innovations for your yard, helping you maximize a small space. I take it all back about the schoolhouse shed. This baby greenhouse is the cutest thing on this list. And it's exactly what it sounds like. The size of a tiny closet, this greenhouse from Design Dreams by Anne is perfect for gardeners to get their seedlings stretching toward the sun weeks ahead of their transplant time, giving your garden a leg up for some amazing summer yields. While it's a little late to help out this season's garden with a greenhouse, having this little gem ready for you next April would be a joy – and a precious addition to any yard or patio. Okay, so maybe I'm just a sucker for mini things. But I'm all about this mini-smokehouse that Ana White has come up with – and I don't even eat meat. Seriously, this thing is genius. She lives up in Alaska, where her family fishes often. Needing a way to preserve it all, she built a small smokehouse that boosts their lifestyle without breaking the bank. What a way to live your dream! With all these different sheds, and the hum of my husband sanding away at our latest project, I feel so inspired to get making! What about you? Which of these sheds is going up in your backyard next weekend?